Japanese firms are jumping into the race to manufacture a new generation of wearable devices that will link people more intimately with the Internet as they grow more dependent on gadgets to manage their lives. Further the Wearable Tech Devices are featuring IoT, BIG Data the technique that connects “things” with the internet and allows it to be controlled wireless and Virtual Reality with real time data analysis and decision making. Traditional Kimonos are IOT enabled, more or less all sorts of clothing are tech devices now. As always Japanese companies have high attention on health, skin and all human consumables. When it comes to wearable devices it is no less. Many Manufacturers have started defining a tech device is that the tech wearable must be able to withstand frequent contact with skin, sweat, and other human factors. One of the textile manufacturer has Conductive fibers connecting the human body to the internet using flexible materials, and data can be check with apps and websites. 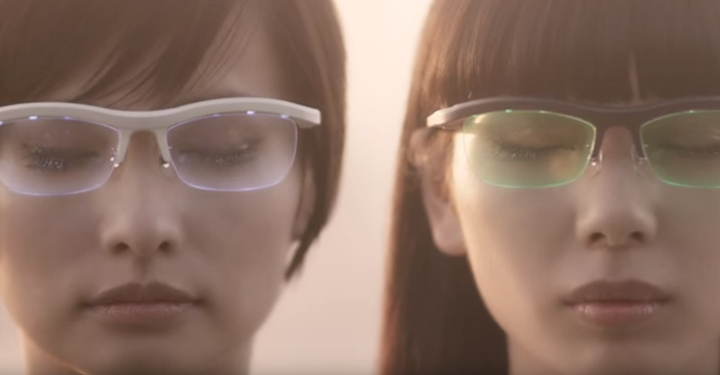 World wide there is craze for tech glasess, more higher in Japan's eyewear. Hakugan displays a prototype model of eyewear with sensors of electroencephalogram (EEG) to measure brain wave patterns. The device, developed with high-tech venture NeuroSky, is the world's first EEG with eyewear as a stress free tool for brain wave tests. Ring ZERO, FUN’IKI Smart Ambient Glasses was created by Logbar Inc. and was founded in 2014 in Tokyo Japan. It now has a San Francisco office as well as their Tokyo Head Office. Ring ZERO allows to control various objects by wearing it on your forefinger and make gestures. It is a magical device that enables to change slides in a presentation, turn on/off the lights, play VR games and change music. It is connected via Bluetooth which allows it to recognize gestures made within 20m away. The device itself is very light and small. As a fashionable ring, it is a little bulky because of the battery. However, it looks stylish and makes as the most fashionable Finger ring. Also FUN’IKI Ambient Glass works with an app and connects via Bluetooth which transmits information wireless. It can smartly support in everyday life by notifying of schedule, emails and messages, reminding without the need to look at a phone. It also functions as a timer, stopwatch, and tempo guide. Its also great at parties because the finger ring can light up with multiple colors! As a tech observer, one would like to have this product ; The Wearable News bag . This product is a bag that incorporates a live news feed on the bag. The concept is to allow “news” to be designed fashionably so that it can be “worn”. In other words, one would be showing the public something that they think is newsworthy. The aim in creating the Wearable News Bag was for the youth to wear news and making the streets up to date. Created in an incubator space at Japan’s biggest newspaper company, Asahi Shimbun Media Lab in September 2015, there are no plans to mass produce it currently. In addition to human wearable devices, PET related sensors tech devices are on rise. Be default Japan has extra care for pets, on average a person who owns pet tends to spend more than 10% of his income for pets, A communication device called the 'Internet of Animals', developed by Japanese electronics venture Anicall has captured media attention. The device is equipped with sensors of motion, temperature and air pressure which can be display an animal's feelings on the owner's smartphone. In Tokyo, it is challenging to make tech look fashionable. It appears that battery life was the biggest challenge in all the devices and there was only a limited amount of fashionable wearable pieces of technology. Also, Inconsistency of data remains one of the top challenges for wearable technologies today. For wearables to be effective across both primary and secondary devices, there needs to be an established frequency of measurement. Enterprises are seeking partnerships and develop IT and platform alliances to deliver seamless experiences on both the front end and back end of wearable implementations while Product designers are on the ever look out on how to make TECH DEVICE more FASHIONABLE.